That’s what one resident at Cape Memory Care said to Michelle Girard-Lynds about how she feels about the Pine Tree Society Community Services Program members who volunteer there every week. Michelle is a direct support professional for Pine Tree Society’s Community Services Program in Scarborough. Every Tuesday, she and the people in her program arrive at Cape Memory Care with one goal in mind: to make a difference. The residents of Cape Memory Care are living with Alzheimer’s disease or other memory impairments. 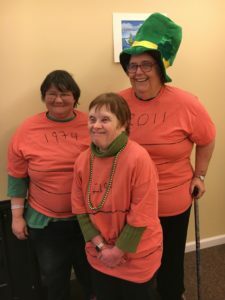 The people in Michelle’s group are adults with disabilities who she works with to help develop the skills they need to live healthy, socially connected lives. Volunteerism is an important part of the program. Michelle plans all the activities with the people in her group, then, together, they facilitate the activities at the center. Gradually, the group members have taken on more responsibility planning and doing the activities with the residents on their own. 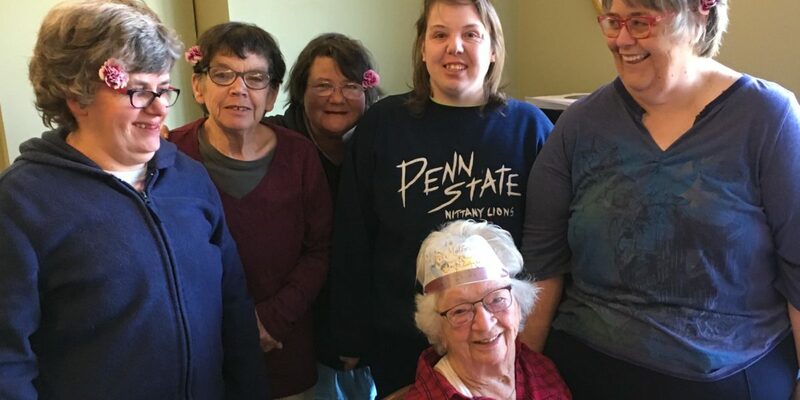 From memory trivia to calling bingo, making floral arrangements and balloon volleyball, every week, they know they are making a difference in the residents’ lives. It’s a win-win when members of the Pine Tree Society Community Support Program visit the residents of the Cape Memory Care Center.